The flail cutter attachment clears brush and small trees while distributing cut materials evenly. With a cutting width of 79 in., the flail cutter (or flail mower) delivers excellent cutting, mulching, and mowing action for materials up to 3 in. in diameter. The flotation linkage and compact deck length allow the flail cutter to float over ground contours, maintaining surface contact for optimal mowing performance. The thick steel deck design protects the attachment and provides maximum strength for tough clearing jobs. 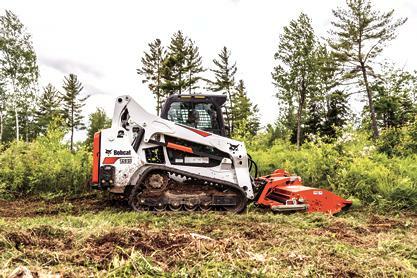 This efficient attachment excels in applications such as agriculture, landscaping, utility, and rental. Other applications include maintenance around personal and lakefront property, construction sites, power lines, road right-of-ways, trails, and other areas needing brush mowing or small tree removal. Rather than rotate, the hammers cut vertically so cut materials are thrown down on the ground rather than out to the side. This allows cut materials to be spread evenly for a finer finish. The flail cutter attachment can also be operated while traveling in either forward or reverse. Variable Displacement Motor: Allows the flail cutter to be "tuned in" to the machine, depending on its hydraulic capacity. A control on the attachment, which connects to the motor, adjusts the hydraulic flow. This makes it possible to use the flail cutter with an assortment of carriers, a feature critical to the rental market. Can be utilized on machines with hydraulic flows ranging from 17 gpm to 40 gpm. Adjustable Rear Gate: Open or close to vary the size of discharge material; ranging from small (for mulching applications), to coarse (for high-performance cutting). Automatic Blade Shut–Off Device: When the flail cutter is raised off the ground, this device stops flail rotation preventing debris from being thrown towards the operator. Floating Linkage (standard): Along with the compact deck length, the flotation linkage allows the flail cutter to float over ground contours, maintaining surface contact for optimal cutting performance. Full-Width, Adjustable Tapered Rear Roller: Provides greater turning ability during operation, making it easier to maneuver the flail cutter in tight areas. Safety Compliance: Complies with the SAE J1001 standard for industrial flail mowers. Thick Steel Deck: Designed with 1/4-in. steel, the deck is designed for maximum strength and durability. Three Cutting Heights: Allows several options of cutting heights for a variety of terrains and brush types. Heavy Duty Front Rubber Flap: Helps contain debris.